We believe in creating a powersports shop where the customer always comes in 1st place. Welcome to Moto Aspirations; a locally owned and operated powersports repair business serving clients in Central Oregon. Founded in 2011 by Kyle Kopachik, Moto Aspirations brings you over two decades of industry experience. We are fully equipped to offer diagnostics, maintenance services, and repairs for dirt bikes, motorcycles, ATVs, snowmobiles, snow bikes, personal watercrafts, and side-by-sides. At Moto Aspirations it is our mission to deliver exceptional service and create a great customer experience. You will find a unique atmosphere where your mechanic truly cares about you as a customer and the performance of your powersport vehicle. Additionally, all of our work is backed by our 5-star mechanic guarantee. ​Born and raised in Tampa, FL, Kyle Kopachik is a third generation motorsports enthusiast. As Kyle puts it, I have moto oil running through my veins. At the age of 4 Kyle’s father introduced him to what would become a passion for motocross and eventually turn into a full blown career as a mechanic. His first experience was riding a 72’ Bultaco, the throttle stuck, he literally climbed a tree and after that experience he was hooked to the thrill one experiences from riding motocross. On weekends his dad took him to the local moto track in Dades City Florida and he watched the pros rip the track. He was inspired by Ricky Carmichael and James Stewart to one day become a professional motocross rider. For years Kyle was ranked 4th in the state in the Gold Cup and RM Cup and these experiences eventually landed him working as a mechanic on the same machines that he loves to this day. Kyle still loves racing moto and he will likely beat most youngsters out there. He got his first bike at the age of 9; an ATC110 called Miss America. At a young age Kyle was introduced to racing motocross and by the age of 12 he was helping other racers repair flat tires and tune their bikes to better perform during races. He was a great racer, but destine to become an even better mechanic. Word got around the track that this Kyle kid #301 could work on bikes and from there his career started to grow. It just clicked for him and now looking at a fully assembled engine he can envision it coming apart in 3D. Becoming a 5-star rated mechanic was truly meant to be. His love for the industry is driven by getting to spend time with some of the coolest people in a community that has a true sense of comradery. It is a sport that brings family, friends and strangers together to experience the great outdoors. Kyle has been a full-time mechanic since 94’. He started his career at Herb Cycle Town in Cottage Grove, Oregon where he learned the ins and outs of the trade. In 2011 he brought his skills into his own business; Moto Aspirations. Since day one he has operated under the belief that the most important things he can do are provide great service and create a welcoming atmosphere for his customers. 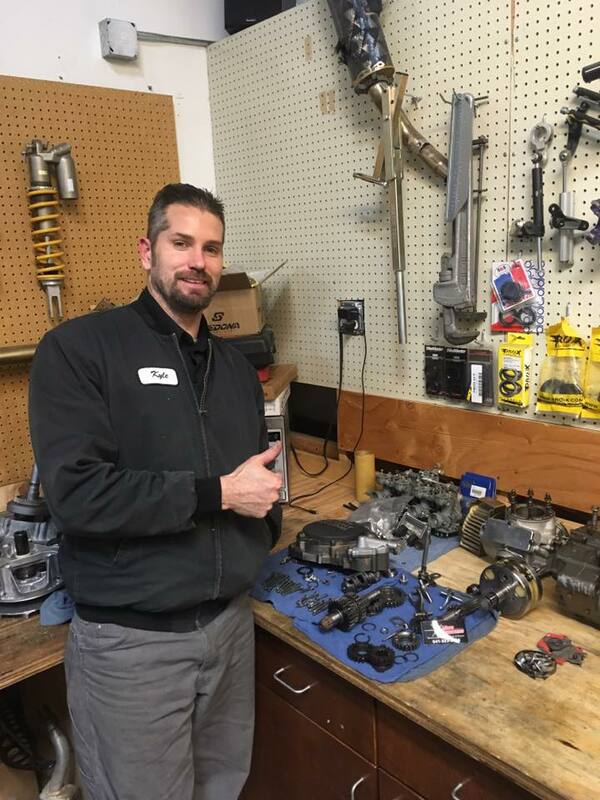 At Moto Aspirations Kyle wants you to understand what you are spending your money on and feel like you are working with someone who truly cares about the performance of your machine.